Note: Today is day 11 in my series 30 Days of Thankful. I'm trying to keep things light here in thankfulness land for a few days because I had a lot of emo posts earlier in the week. So for today, I am thankful for something a little less serious - 11:11. Today is 11/11. A palindrome day. Where the date is the same forwards and backwards. (at least the month and day) I've never been into math or numbers, but I have a special fondness for palindromes. I like them so much that I intentionally graduated from college early - in 2002 - just so I could forever say I graduated in a palindrome year. Nerdery at its finest, folks. For me, the time 11:11 has always held a special significance. I can't tell you why, but I seem to see 11:11 on a clock more often than any other time of day, both day and night. And apparently so do a lot of other people. According to the interwebs and this guy, seeing 11:11 is like seeing a glitch in the Matrix. The 11:11 theorists state that if you have a thought at 11:11, it's a "true" thought. It's a moment in time where you are communicating to the universe and whatever you are thinking must be true or whatever you're wishing for will happen. I don't know that I believe that, but...lots of other people do. 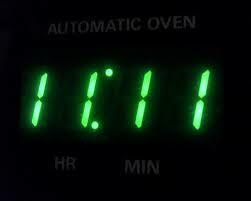 I was told at some point in my life to make a wish if you see 11:11 on a clock, so I've made a lot of 11:11 wishes. (And apparently so have a lot of other people, according to this article.) And I can honestly tell you that many of those wishes have come true. Sounds nutty, I know. Maybe I'm a realistic wisher or having something at the forefront of my consciousness makes me more likely to put things in motion to make said wish come true. I mean, I've never wished to win the lotto at 11:11. Or to suddenly own a mansion. I've wished for things like love and goals in my life to come true. My 11:11 wishes have never come true over night. They've taken quite awhile to come to fruition. Months, even. But they've happened. I don't buy into this "talking to the universe at 11:11" concept, but I do think it's important to have wishes. And hopes. And dreams. It can't hurt to wish for things. The worst thing that will happen is that it won't come true. Whenever I make a wish, I feel a little goofy, but I feel connected to my childhood where the world was a simpler place and I wished for all sorts of things. Maybe I'm 31 going on 13, but in my opinion, a little wishing every now and then can't hurt. P.S. The Mayans claim the world is going to end at 11:11 on 12/21 so I definitely know what I'll be wishing for in that moment!